On this, the second day of the New Year, we venture further ahead on the outer edge of the Moorland Zone toward the Alpine Desert. Descriptions mention leaving behind the colourful bushes, scrub grasses, and interesting plant life in favour of rocky, barren, and dry expanses of the high desert areas. The day promises to provide amazing views of the summit, Kibo, looming through the mist. A foray into personal experiences (as documented in various blogs) indicates that some climbers start to falter at this time. The fortunate few simply experience a persistent headache while others have stomach upset or worse. Most are taking Diamox at this stage to provide some assistance to reduce symptoms of altitude sickness (AMS). Yet the drug isn’t always pleasant as it can cause its own upset and at a minimum tingling in hands and feet, dizziness and headaches. For some, though, it can make the difference between being able to continue on and not as it aids the acclimatization process. When I pursued the Everest Base Camp trek in 2008, the group was comprised of a twosome or more in each decade representing the ages of 20’s, 30’s and 40’s. All of us, even the most fit including a young fellow set to begin a career with the Royal Army the following month, suffered at different stages of the trek. It is not unusual but I suppose we all hope that we will be one of the lucky ones and be unaffected. Physiology, as I indicated before, is the unknown and yet influences how our bodies will adjust to the increasing strain on it. 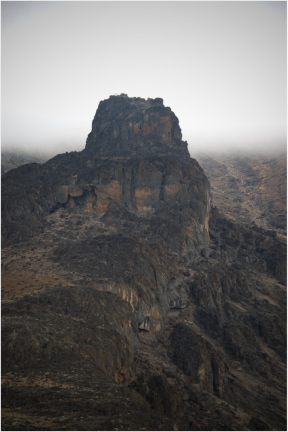 Our trek to Barranco camp includes a lunch break at the base of the Lava Tower, a 300 foot near-vertical rock formation. At its peak, it is 4,800 metres, 400 metres higher than Mt Rainier. It provides an opportunity to gain some altitude before descending through the Giant Senecio terrain to Barranco camp. This is consistent with the age old wisdom of “climb high, sleep low” to hasten the acclimatization process.